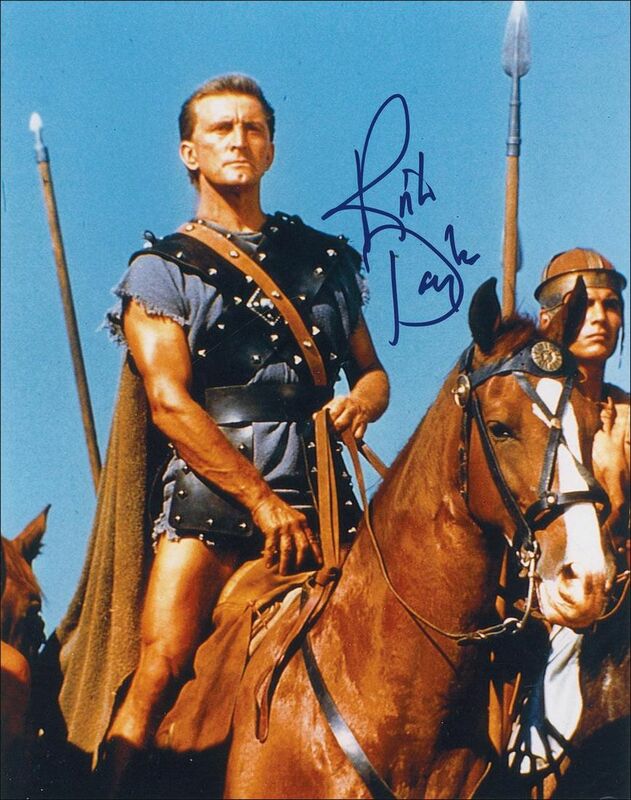 So who is Kirk Douglas? Well, besides Michael’s father? Catherine Zeta Jones’ father-in-law? Certainly a living legend, although I had a couple of people ask me today “Is he still alive?” Surely he is and he just came out with a new book that he has proclaimed as ‘probably’ his last autobiography. Douglas was at the top of movie fame in the 1950s and early 1960s. Most in our generation knows him from either Disney’s “20,000 Leagues Under the Sea” or the big epic “Spartacus.” He never won an Oscar but was awarded one for lifetime achievement. He was about as powerful as an actor could be, basically calling all the shots on his movies and in his heyday was known as a tyrant. Obviously he slowed down quite a bit as age caught up with him and only appeared here-and-there in films after the mid-1960s. New stars rose and he disappeared as Michael’s fame took off in the 1980s. A few years ago, Kirk had a stroke and that left him with the residual speech issues. A little-seen movie featuring him with Michael and some other Douglas family members dealt with that issue. Anyhow, our paths seemed destined to cross tonight. As I rounded the car onto Sunset Blvd, everything felt like it was going better than planned. Then the first issue occurred. I drove past Book Soup and realized there was nowhere to park. I’d feared this problem, having read online that the bookstore was noted for its horrible parking situation. Nowhere could a spot be found…. until I spotted a tiny lot that had a couple of open stalls… on the other side of the street… as I drove past it. Turning around should have been simple, but tonight was not to be a simple night. No, tonight was to be the night that Britney Spears returned to the Sunset Strip, playing a last-minute show at the House of Blues. Tonight meant gridlock on Sunset. Thirty minutes passed before I could get the car turned around and back on course. I actually missed the lot again from the opposite direction and went so far as Rodeo Drive in Beverly Hills (not THAT far… but still bad) before realizing how far I’d overshot the parking lot. Suffice to say, the car finally got parked after yet another turnaround. Inside I went to Book Soup. I was #38 in line and browsed around the store’s extensive film section for the next hour. Waiting. Someone on the staff mentioned that Mr. Douglas would be tired due to having spent four hours that afternoon in a Vanity Fair photo-shoot. There were more photographers lining up in the bookstore. Mr. Douglas came out to a applause a few minutes before his scheduled arrival. He gave a short speech about the new book and his wishes for his grandchildren’s generation (roughly my age; I was the only one buy the book who was around that age, so it seemed that I might be our only hope). Douglas’ speaking was obviously slowed by the aftereffects of his past stroke, but one could still understand him easily enough and he looked okay for a guy of 90. The distinctive cleft chin was still readily apparent. He took a couple of questions before signing. One came from the middle-aged Stanley Kubrick fanatic in the room and you could tell that questions about working with Kubrick had come up many times before. Kubrick had directed Douglas in the anti-war film “Paths of Glory” and came in under Douglas’ recommendation to do “Spartacus.” Neither movie really had the distinct characteristics that would make Kubrick a legend (with “2001” or later movies like “The Shining”) and Douglas was known to have bullied Stanley back in the day. Thus, Douglas’ description of working with Kubrick was pretty ‘stock’ and basically praised Stanley before moving along. The second question focused on Douglas’ work with another legendary director: Billy Wilder. They’d only worked on a lesser-known 1950s movie called “The Big Show” and Douglas reflected on how one’s success often comes down to making the right decisions (yes, yes, not exactly the most ground-breaking observation). As an example, he pointed towards not making other movies with Wilder despite being offered the lead in Wilder’s film “Stalag 17″… William Holden took that role and won an Oscar with it. One rather sad moment of the evening came when Douglas commented how living to 90 does cause him to often realize how good his friends were only after they’d died. He cited relationships with Wilder and Frank Sinatra in that regard. On that somber note, the book signings began. There wasn’t a huge crowd, so it was taken at a leisurely pace. I was to the front after about ten minutes and after he signed my book, I attempted to get a photo with my slick little mini-camera (bought specifically to be used at such events whereby my big, bulky camera was a hassle). So the photo was taken quickly and off I went. Then I checked the photo on the camera and found out that the battery had gone dead before it had been taken. Yes. Here I was, Mr. Douglas’ hope for the future of mankind. And I can’t even get the camera battery squared away. So, while I got a signed book out of the deal and a few minutes of memories, alas no photo of us together shall exist. With that, I trudged back to the parking lot and high-tailed it for the apartment, the whole time hoping that Britney didn’t decide to let out early.